Today’s smartphones offer an extra advantage that often goes unnoticed by many. With a five or six inch display, it is possible to have fun with multiplayer games using a single smartphone or tablet. Yes, you read that right, there are multiplayer games developed to play on a single screen, and they’re sensational! I’ve created a short list with the best of them. This fun party game has up to four players assume the role of egoistic opera singers who are trying to push their rivals off the stage. You've got to keep your tenor in the spotlight while using the power of your girth to knock the others away. The controls are intuitive for most people to grasp quickly, and even your most touchscreen-averse friends and family members will quickly become fierce contenders. Each player has a button that sends their wobbly warbler to the center stage, and the game's spinning physics takes care of the rest. Chain Reaction is a kind of strategy 'board' game for up to 8 players that share just one device. Players take it in turns to place colored orbs into cubes on a grid. Once a cube has reached critical mass the orbs explode into the surrounding cells adding an extra orb and claiming the cube for the player. The goal is to overwhelm your opponents orbs, taking over all the cubes on the board. Simple yet addictive, Chain Reaction is a great time killer for a large group of friends. Even the most casual of mobile gamers probably know about Fruit Ninja, one of the first mobile games to be successful around the world. What few people know is that it has a multiplayer mode that you can play on a single screen. So, along with your opponent, you can use a single smartphone to cut all that fruit. There are two modes of play, Classic Attack and Zen Duel. In the first mode you play as you normally would, cutting fruit in half with your sword and losing if you miss three fruits. In the second mode, you have to cut as many fruits as possible in two minutes. Air hockey is another well-known game. The smartphone version isn’t exactly famous, but you’re probably already familiar with this fun game that’s often played at arcades and in malls. It’s a great game, where a table humming with air lets you send hockey pucks flying. The objective is hitting the puck into the opponent’s goal. The concept in Glow Hockey is the same, only you’re using a smartphone screen. You and your opponent hold the device with one hand and block each other’s shots with the other. It may sound silly, but in one minute you’ll be absorbed by the competition. It’s great for playing with friends or with kids. Badland is a beautiful game that won several awards in 2013 and 2014, and although it’s best known for its single player mode, it also has multiplayer modes for up to four players. You can play either with or against each other. The most important goal is to survive a deadly scenario, similar to Super Meat Boy. In multiplayer mode, each player has their own portion of the screen dedicated to their character. The goal is to reach the end of the individual stages. In the competitive mode, you can lead friends to their death, which will lead to plenty of laughs and quarrels. It’s totally free, although it has some extras that can be purchased. This is definitely worth it if you’re a group of a few friends looking to have some fun. The sequel, Badland 2, expands on the physics based gameplay and dark atmosphere, while managing to be even more good-looking than the first one. Thankfully, it has kept the local multiplayer mode, so you can still enjoy competing with your friends all on the same smartphone or tablet. This is one of the most unique and beautiful games on this list. It will make you dance. 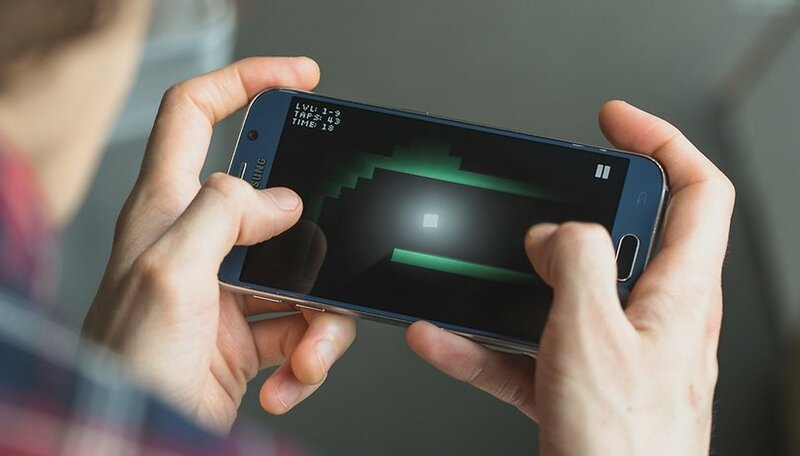 Yes, this game demonstrates that with some creativity, you can take your smartphone to levels you couldn’t imagine. As you play, you and your partner hold the smartphone and press a button on the screen. From there, you just have to do what the game says. There are commands to spin, rotate, and perform dances, always with the goal of doing everything in sync. It is one of the most original games that exists for smartphones and it will definitely make you laugh. Just be careful not to drop your phone on the floor! Omicron has more of an abstract vibe. It’s almost a board game with a geometric look and no characters. The path to victory requires some dexterity. This is a game to play with a good friend, if you want to see him or her get angry once you win. It’s also designed for a single player, but it’s just as fun with the competitive mode on a single screen. Different-colored cubes appear together on the screen and your mission is tap on them so that they’ll disappear - always tapping the color that is called for on the edges of the screen. Utilizing a retro 8-bit style, Micro Battles is a cute game designed for quick matches between two players. It's a 2-player exclusive and it’s made up of competitive mini games. In the free version, one of the four mini games can be played per day. You can pay an additional $1.99 if you want access to all four at once. But there is a way to play more than one per day - you just need to download the other two editions of the game. That’s, in total, 12 fast and distracting mini games. They have different themes, such as outer space, the old west, airplanes, soccer, vikings, and more. This game follows the same premise of the mini games from Micro Battles, just with a slightly different (although more competitive) theme. Each player holds the smartphone on one side, and the other uses their fingers to play. It has games like the ones on this list such as hockey, but there are other more competitive ones like hot potatoes. There are 11 mini games, nine of which are free. You can unlock an additional one, if you like the company's page on Facebook. The final one can be unlocked with an in-game microtransaction. Although it looks cute, it can get super competitive and creates enough tension. It’s great for distracting your kids or passing the time, as you can also play against the computer. This game has a much higher price compared to others on the list, but I still decided to include it. In Keep Talking and Nobody Explodes, players use the same smartphone to play, but don't use the device at the same time. You also need another device (either a smartphone, tablet or computer) to access the manual used in the game. Extremely fun and full of tension, in this game, one person takes care of a bomb that needs to be defused, while the other has to use a manual and give them instructions on what to do. If you don't solve the riddles in time, the bomb will explode and everyone loses. It’s a frantic game you’ll either love or hate. Oh, and you need a VR device, but if you don’t have one, you can also play the PC version. Are there any other multiplayer games you like playing with friends? Let us know in the comments. Some of them are not free. It's only the Badland that look cool to try. I love to play badland. Great collection of games. I really love it.